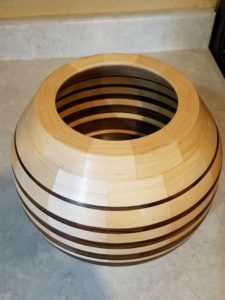 I recently finished this bowl that is destined for a fund raiser held at my youngest daughter’s old high school. It’s now off the chuck, a final polish, the bottom finished, and just delivered this morning. 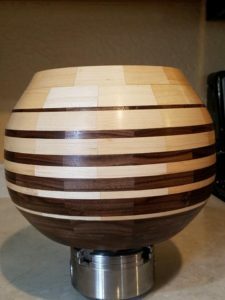 Maple and walnut, about 7″ tall and 8 1/2″ in diameter. Hopefully it’s looked on favorably at the auction. I’ll update the post once I find what the highest bid for it ended up being.